PD613, SKD61, 1.2344, SUS303, DC53, H13, Etc. 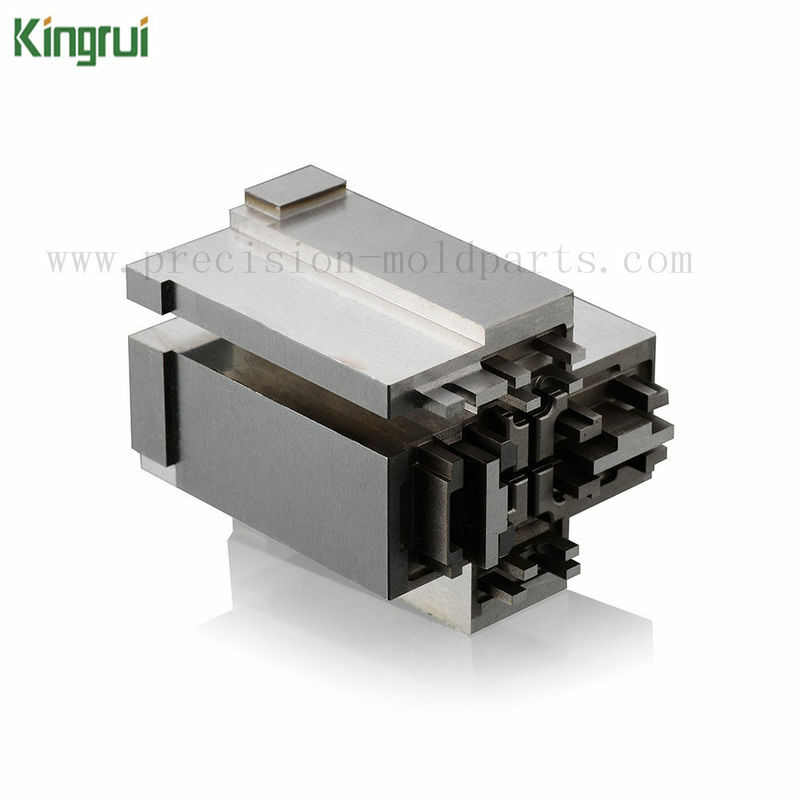 Kingrui machining produces all kinds of precision mold parts such as: EDM spare parts, WEDM mold parts, Injection mold parts, etc. All metal parts were produced by ourselves and checked by experienced staff before shipping. So customers don't need to worry about the quality of our products. 1. Material: stainless steel was used to processing the EDM spare parts, aluminum, copper, tungsten and others can be seen in our factory, or according to samples or drawings. 2. Mold Parts Processing: as can be seen from the above picture, the main processes of this part are precision grinding and discharge machining. And its characteristics are very obvious, all the discharge is highly concentrated in the head position, it takes some time to complete well for such muchcomplicated discharge processing. 3. Surface Treatment: Plating, powder coating, spray- paint, electrophoresis, hard anodizing, electropolishing, Black Treatment, Hot Treatment. 4. Equipments: Involved surface grinders and Sodic EDM. CNC milling machines, wire cutting machines, punching machines and so on, we aslo use them to manufacture your parts. 6. QC: Check every process before shipping and supply test report about your parts for you . Machining Equipment Grinding Machines / CNC Milling Machines / EDM machines, etc. 3D--UG files: like STP, IGS, X_T., Prt. Service- Oriented: A full range of pre-and after-sale services to help customers improve product value. Continued after-sales service will inhanced the customer's satisfaction in using our toolings. For each of bad mold parts, we will rework ! Price Advantage: Factory direct sales with reasonable prices! According to your drawings or samples for production, will be more in line with your needs, and save your money and time. Best Material: Our materials are genuine, can provide proof of factory material. Usually we first use the PE protective film as the inner packaging, and then packed with plastic boxes, and finally packed in cartons, of course, can also be customized according to your request packaging. • Worldwide shipping, we can deliver by EMS, Fedex, DHL, TNT, ARAMEX or by sea. • Items will usually arrive within 7 days.